The ADV-5160QM is a professional all-in-one high density IP/ASI to DVB-C QAM modulator. It receives up to 160 digital TV transport streams from Gigabit Ethernet and 4 ASI streams from 4 ASI ports. 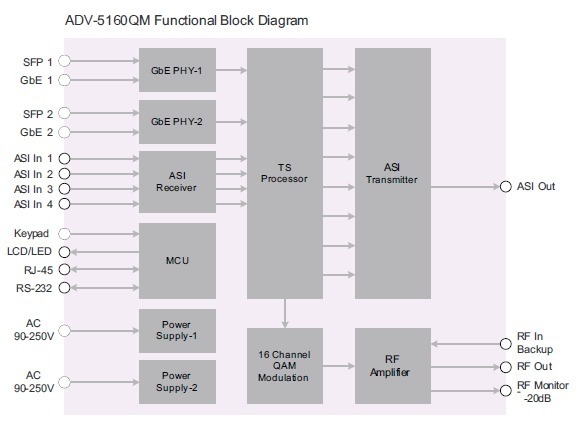 It outputs up to 16 QAMs RF channels. A powerful TS re-Multiplexer matrix rebuilds up to 16 new TS streams for further QAM modulation. These 16 QAM carriers are directly independently up-converted with high speed DAC to achieve excellent RF performance covered the whole 1GHz band. ADV-5160QM is housed in a 1-RU chassis with two AC power supplies in redundancy. Click on “ADV-5160QM Datasheet” for technical specifications.